Object Record explores poetic and narrative potential of the Internet of Things #BeagleBoneBlack @TXInstruments @BeagleBoardOrg « Adafruit Industries – Makers, hackers, artists, designers and engineers! The New York Times R&D Lab has created Object Record, a device that pairs objects with sensors that perceive environmental conditions around it through touch, motion and more. Object Record prints a constant monologue of its perceptions of and responses to the changing input. 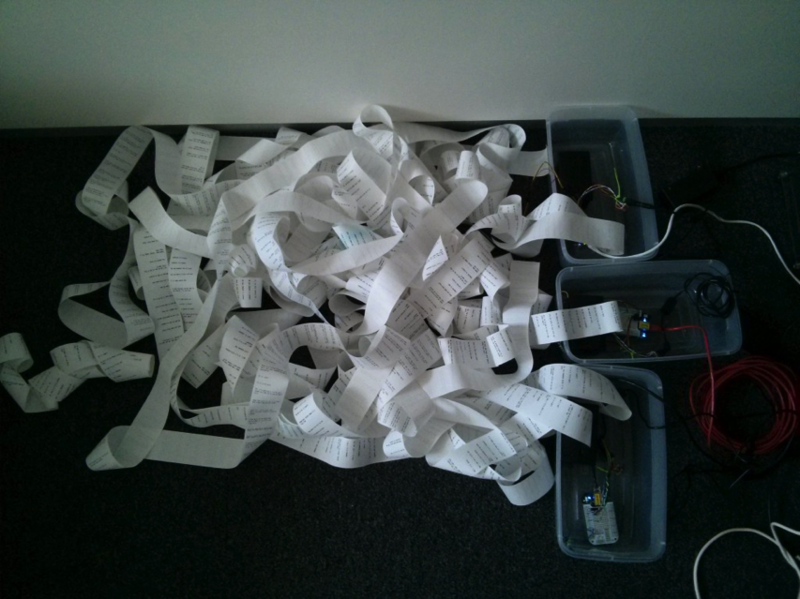 The text of this monologue is printed out in ticker form on a mini printer so that visitors can see not only the current “thoughts” of Object Record, but its “memory” as well. Object Record is part of The New York Times’ effort to discover and explore the poetic and narrative potential of the Internet of Things (IoT). “As more of our objects and environments become actuated, connected, and data-enabled, these enchanted objects are developing the capacity to contain their own stories. An object can remember its history, can understand how it’s used, [and] can to talk to other objects around it to understand its environment. As these capabilities evolve, objects no longer become inert backdrops to our experiences, but active participants in our world that can share stories about themselves and us,” said Alexis Lloyd, Creative Director of the R&D Lab at The New York Times. The Sitara processor-based BeagleBone Black is the main system controller for Object Record. BeagleBone Black meets the lab’s needs because of its low price, large feature set and ability to run the Linux operating system. The large feature set enables prototyping without worrying about network, memory and other constraints, and the ability to run the Linux operating system allows developers to program in the language that works best for them. Object Record code is written in Python, for example, and uses the Adafruit BBIO library to interface with the GPIOs. Noah added that the BeagleBoard.org community, the Adafruit forums and PyBBIO helped his team emerge unscathed from this and many other challenges they faced while developing Object Record.